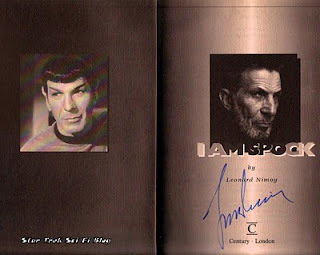 In 1995, I got a chance to meet Leonard Nimoy aka "Spock". It was no small experience for me, let me tell you. He took time out to unite with the Trekkies and returned the Vulcan "Live Long and Prosper" salute for us which was a pretty awesome experience. The great vulcan himself signed my hardback copy of "I am Spock" right in front of me which I still treasure to this day. 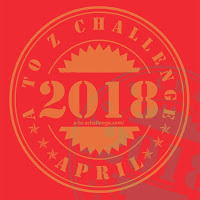 Image Owner/Creator Paramount Pictures and/or CBS Studios. 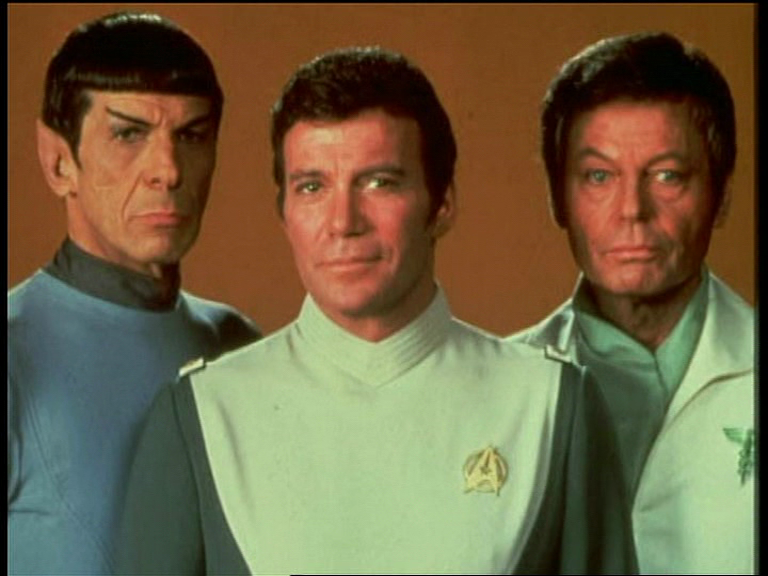 In 2270 Mr Spock lives on planet Vulcan. At the Gol temple, he attempts to complete the disciplines of Kolinahr by purging the last of his human emotions. However, the Vulcan is clearly distracted by something far away in the distant depts of space. A Vulcan Elder is about to place the ancient Kolinahr pendant of logic around his neck but a disturbed Mr Spock stops her. A mind meld later reveals Spock is still conflicted about human emotions which an alien entity has somehow awakened. Spock fails to complete his Kolinahr vulchie training and instead is drawn to a powerful object named V'Ger making direct contact with it. Meanwhile in close proximity to the Federation's Neutral zone, three Klingon battle cruisers are violently engaged with a vast, mysterious object on a direct collision course with Earth. The Klingon K'tinga class fleet attempt to investigate a celestial cloud, scanning it and firing torpedoes at will, except the Klingons have underestimated the power hidden deep within this unknown. The cloud assimilates everything sent its way. Frightened, the lead captain orders a retreat but its too late. A bolt of plasma energy is fired out from within the dark expanse of the mystery unknown and strikes the Klingon ships, one by one.... The cloud systematically eradicates them along with their fierce warriors who vanish into thin air. James T. Kirk has now become a cranky desk-bound Admiral promoted to Chief of Starfleet Operations on earth. The former starship captain shuttles over to Starfeet Headquarters with every intention of regaining command of the USS Enterprise NCC 1701. Once on board the ship, Kirk meets Captain Decker in Engineering who is hesitant about relinquishing command of his beloved starship. Angered, Decker sandbags Kirk about being "out of touch" with the new Enterprise systems. Kirk realises Decker's expertise is crucial to the success of the mission and with the Enterprise, her crew and earth hanging in the balance, Decker stays onboard as Executive Officer, temporary grade reduction in rank..
Kirk suffers an early blow when his new vulcan Science Officer, Commander Sonak is captured in a horrific transporter accident along with another crewman. Yeoman Rand is struggling with the transporter controls when the Alarm sounds. Chief Engineer Scotty yells into the intercom: "Transporter room, do not engage! Do not...."
Kirk exits on a run, followed by Scotty. Strange flashing sounds and a defective transporter beam up is in progress. Its obvious something has gone badly amiss with the transporter. At the console Chief Rand is trying to overcome the problem with the beam up of Commander Sonak's lifeform degrading before them. The human energy patterns flicker into fuller materialization but they're "Forming". Rand vainly attempts to save Sonak and the woman but her grief, panic stricken face says it all. Its a desperate no-win scenario..... We hear a scream of pain and a moan from Vulcan. Kirk takes over but its too late. The death cries reverberate around the Enterprise transporter room, a strange phenomenon in itself. "Enterprise, what we got back didn't live long.. fortunately." On the Recreation Deck, the admiral informs the assembled Enterprise crew about the effect V'Ger's destructive powers have had on Earth's defenses. Its unlike anything Starfleet has ever been faced with before. 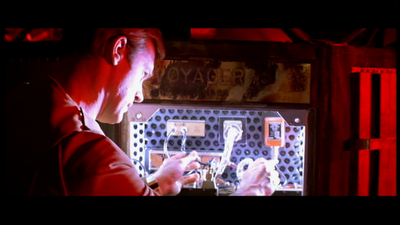 Kirk tells his crew that V'Ger is two and a half days from earth. The Epsilon Nine Station interrupts the briefing with an emergency call from Commander Branch. "Enterprise... the Cloud is definitely a power field of some kind... Measures... My God! Over 82 A.U. 's in diameter..."
Branch orders their shields to maximum power as the Epsilon station is attacked and obliterated before the Enterprise crew's very eyes. Cadets and Officers alike are shocked and stunned into silence. Somebody eventually lets out a scream. Admiral Kirk has to compose himself. "Our orders are to intercept,investigate; and take whatever action is necessary... and possible. 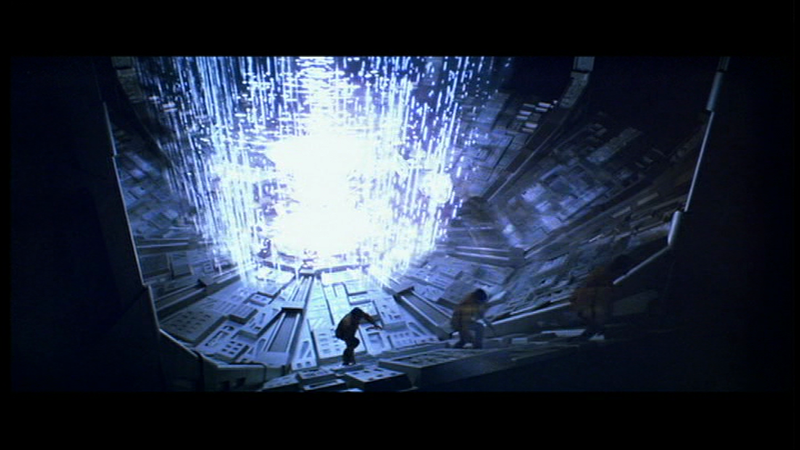 We can only hope that the life form aboard that vessel reasons as we do." 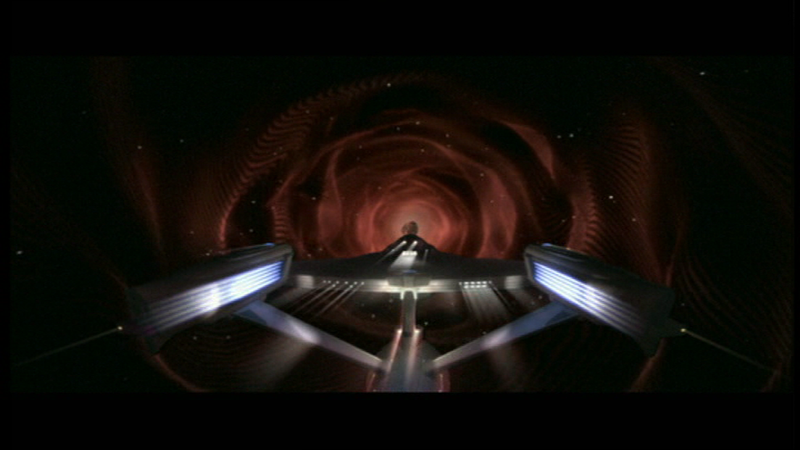 The Enterprise has to Intercept V'Ger and prevent it from reaching Earth at all costs. The crew is given 40 minutes to gather their wits prior to the prelaunch countdown. Dr Leonard "Bones" McCoy retirement on Earth is rudely cut short along with Lieutenant llia, the navigation officer who beams aboard the USS Enterprise NCC 1701 at Kirk's request. "Bones" is not a happy man. In fact he's extremely peeved about being drafted into service without a moments notice. James T. Kirk: "Well, for a man who swore he'd never return to Starfleet.."
Leonard McCoy: "Just a moment, Captain, sir. I'll explain what happened. Your revered Admiral Nogura invoked a little-known, seldom-used reserve activation clause. In simpler language, Captain, they drafted me!" James T. Kirk: "They didn't!" Leonard McCoy: "This was your idea. This was your idea, wasn't it?" yells McCoy pointing the finger of blame right at Kirk. James T. Kirk: "Bones, there's a thing out there." Leonard McCoy: "Why is any object we don't understand always called a thing?" "Its Headed this way. I need you. Damn it, Bones, I need you. Badly!" pleads the admiral extending a hand. Leonard McCoy: "Well, Jim, I hear Chapel's an M.D. now. Well I'm going to need a top nurse... not a doctor who will argue every little diagnosis with me. And they probably redesigned the whole sick bay too! I know engineers, they love to change things." James T. Kirk: "Well, Bones, do the new medical facilities meet with your approval?" Leonard McCoy: "They do not. It's like working in a damn computer center." The original crew are called into action on a deadly mission with one exception. The safety net, Spock is missing. This is gonna be one heck of a rough ride. Starfleet Officers have sworn a solemn oath to serve and protect. Theres little hope about reaching a truce with the killer energy cloud exterminating Federation ships and planets completely from existence. 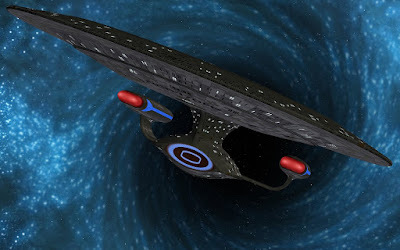 The Enterprise leaves earth's orbit except an anti-matter imbalance with the warp drive engines causes a terrible malfunction creating a wormhole distortion. 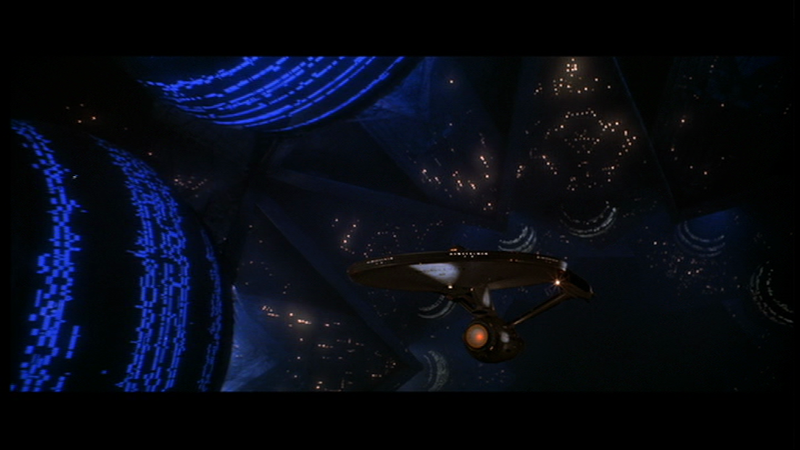 A sudden spiraling of stars and light appear hurtling the USS Enterprise NCC 1701-A into a Vortex. Kirk shouts "Wormhole!.... Get Us back on impulse power! Full reverse!" The Enterprise has been drawn into a matter-time distortion, with stars, people and voices becoming strange, distorted shapes and sounds the further the ship ventures deeper into the vortex. It stays what seems like a really long time with Sulu reporting negative helm control and Uhura confirming that subspace frequencies have been jammed. Suddenly the computer alerts the crew to a collision alert! The vortex has pulled in a pitted asteroid which is obstructing the Enterprise's flightpath threatening to destroy the entire ship. The Deflector Shields are over loaded, so too are the main power systems. Kirk orders Chekov to standby on phasers but Decker steps in and belays the admiral's order. The asteroid is getting larger on the viewscreen. With Chekov's help, Decker diverts power in time for him to arm the photon torpedoes and save the ship. The photon torpedoes float towards the asteroid and explode disintegrating the asteroid into several thousand pieces. The Enterprise's forward shields smash the rock fragments into smithereens as they crash against the ship. Bridge Officers brace themselves as the debris field collides and reverberates throughout the ship, making the Enterprise shudder until a feeling of smooth motion reveals their out of it. Decker explains to Admiral Kirk in the Admiral's quarters why he countermanded his phaser order. Bones tags along and is listening intently. "Sir, the Enterprise redesign increases phaser power by channeling it through the main engines. When they went into anti-matter imbalance, the phasers were automatically cut off." An embarrassed Kirk swallows his pride and acknowledges Commander Decker for acting properly and saving the ship. Decker is aware of this and asks to speak freely. "Sir, you haven't logged a single star hour in two and a half years. That, plus your unfamiliar with the ship's design, in my opinion, sir, seriously jeopardizes our mission." Kirk has to grovel: "I trust you will... nursemaid me through these difficulties, Mister?" Decker: "Yes, sir, I'll do that." Decker is excused. "Then I won't keep you from you're duties any longer." Bones sandbags Kirk over the way he got command of the Enterprise. "You pulled every string in the book short of blackmail to get the Enterprise, maybe even that. And when this mission is over, you have no intention of giving her back." Kirk turns to McCoy for advice: ..."and I intend to keep her?" McCoy: "It's an obsession that can blind you so far more immediate and critical responsibilities." Kirk tells the doctor he has noted his opinion and asks if there's anything else. The Chief Medical Officer gets to the point. "that depends on you." A Vulcan shuttle withdraws from the Enterprise bringing Science Officer Spock on board. All is not what it seems with Mr Spock who takes refuge within the safety of the USS Enterprise starship after his humiliating Kolinahr experience on Vulcania. The Vulcan reports for bridge duty much to everyones delight. Spock is clearly not himself and attempts to implement his mathematical computations without even greeting his old Enterprise friends whom he regards rather coldly. The old bridge crew are puzzled by his reaction to them. Uhura is upset. The vulcan explains he's knows about the Enterprise design difficulties because he's been monitoring Kirk's transmissions with Starfleet Command. Isn't this illegal? why I do believe, Mr Spock has been a very naughty little pointy eared, green blooded vulchie indeed!!! Spock offers his services as Science Officer with all due respect to Decker. 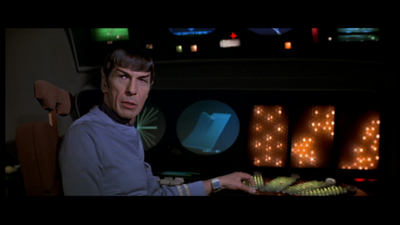 The exec gladly steps aside and allows Spock to take over and assess the defective engineering readings. Spock turns to Kirk: With your permission, I will now discuss these fuel equations with the Engineer." Kirk manages a nod but is puzzled by the Vulcan's strange manner. Kirk: "Mister Spock, welcome aboard!" Mr Spock departs via the turbo elevator. McCoy: "Never look a gift Vulcan in the ears, Jim." Engineering to Bridge... New intermix balance holding steady. She's not even straining! Scottys been dying to give the Enterprise a proper shakedown cruise. The USS Enterprise soon arrives at the V'Ger intercept coordinates. The ship is on Red Alert! Kirk recommends against defensive action as it may be interpreted as hostile. Sulu pushes a button revealing a beautiful, yet menacing cloud on the Enterprise viewer. Uhura continues with friendship messages on all hailing frequencies. Kirk orders the ship to move into the heart of the clouds center. Spock confirms the Enterprise has been scanned but senses puzzlement. "They have... they have been communicating with us. I sense ... puzzlement. Why have we not replied?" The Ship is under attack from an energy bolt which drains the deflector shields by 70%. V'Ger is puzzled because the Enterprise has ignored its message which Spock isolates from the computer records. V'Ger message lasted for only a millisecond!!! In the blink of an eye Spock re-sends the standard Federation message matching the clouds signal speed which instantly calls off the whiplash energy splattering over the entire ship. It was a close call. An alarm klaxon sounds. A terrifying column of mysterious plasma energy bursts onto the bridge. Its a plasma probe. 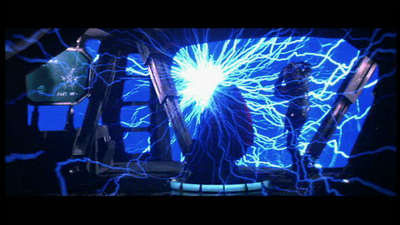 The plasma wave approaches Spock's Science station and attacks chekov who is petrified and screams out in agony. The probe attempts to gain control of the main computer. Mr Spock leaps into action. The "Intruder" learns about the Federations defences. Spock is between the probe and Ilia which moves closer to her freezing her into immobility. 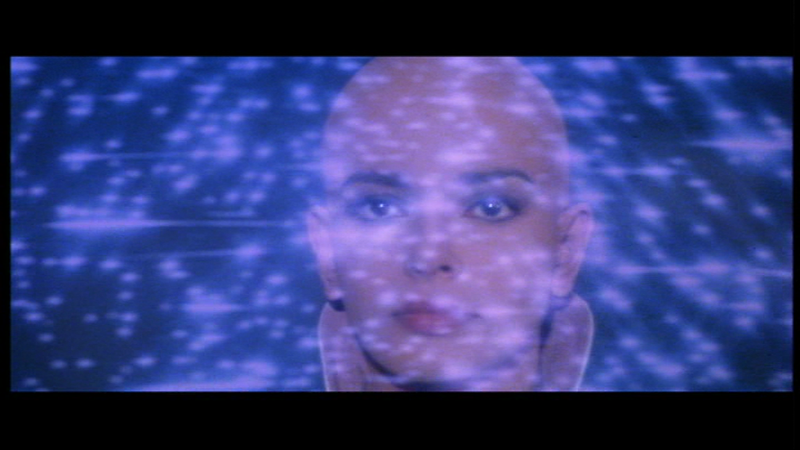 In a flash of blinding white, the energy plasma vanishes with Lieutenant Ilia ditching her tricorder behind. It rattles to the deck plates with a metallic clatter marking the very spot where lovely Ilia was standing. Decker is furious "This is how I define unwarranted!" And almost at the same moment a new Bridge Alarm Signal goes off. The Enterprise has been seized by tractor beam. V'Ger beams an android "Ilia" aboard the ship to communicate and learn about the humans "infesting" the USS Enterprise 1701 and planet earth. McCoy: "Humans, Ensign Lang: us." Decker is assigned to get to get "friendly" with the facsimile of Ilia and find out what she knows about V'Ger. 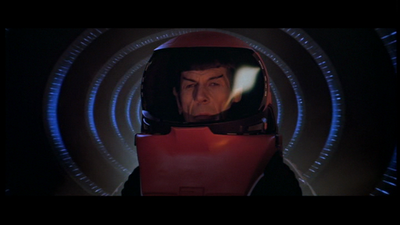 Spock leaves the ship without authorisation in order to attempt a mind meld with V'Ger. 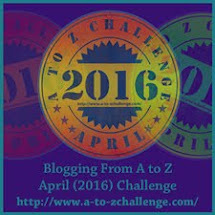 He gets more than he bargained for and is thrown into a coma but rescued by Kirk. Spock explains that he wanted to make contact with a being of pure logic. V'Ger wants to talk to its creator who it believes is on Earth except theres a complication. The cloud, a machine enhanced by machines calls itself V'Ger! This machine is sentient and is actually what remains of the Voyager One spacecraft launched from Earth in the late twentieth century. Despite its vast knowledge incorporated into its memory banks by the machine world, it cannot comprehend human beings or their simple feelings. V'Ger "feels" lonely and barren! ... is so far beyond V'ger's comprehension. I saw V'ger's planet: a planet populated by living machines. Unbelievable technology. V'ger has knowledge that spans this universe. And... in all this order... all this magnificence, V'ger feels no awe...no delight... no beauty... I should have known..."
What should you have known?" Spock: "No meaning... No hope... summoning strength)And, Jim, no answers...!Jim, it's looking for answers itself!" Spock: "Is this all I am? Is there nothing more?" V'Ger's experiences have exceeded it complex programming and it wants more. The craft apparently entered a machine-dominated universe, and encountered an intelligence that reprogrammed it and sent it back on a new mission to seek out and destroy inferior, non-machine infestations. The Enterprise crew rushes to stop it. It reaches Earth and easily deactivates the entire planetary defence system. V'Ger intends to deactivate Earths 'carbon based units' lifeforms unless they bring forth the creator, "The Kirk Unit." who built Voyager One. Kirk is mistaken for the creator and explains to the Ilia probe that he won't reveal who the creator is to V'Ger's mechanism. The bluff works and Kirk, Spock, Dr McCoy, Decker and the replicated`llia'mechanism make their way to a central structure towards the very heart of V'Ger. There's an ancient human space probe there, and Kirk discovers what is in fact Voyager VI scarred by years of deep space exploration..... It is essentially V'Ger, an old earth probe enhanced by an ancient machine race. It wants to complete its programming by telling its creator all it has learnt except V'ger refuses to accept that it was created by a human. Spock suggests that V'Ger has done all it can with logic which is amazing even for him. Kirk: "Capture God! In order to retrieve V'ger's data, the Creator has to physically come here!..." Commander Decker decides to join with the Ilia mechanism. Spock: "Jim... he wants it." Decker: "You got the Enterprise, it's what you wanted. This is what I want." And then Decker shoves the tricorder into the access hatch. Ilia and Decker merge as one, and transcend our universe. Self preservation kicks in and our heroes decide to hightail it back to the ship. Planet Earth is saved from the wrath of V'Ger. Back in the captain's chair, Kirk orders a shakedown cruise for the new USS Enterprise NCC 1701. Guest stars include: Stephen Collins and Persis Khambatta, as well as brief appearances by previous Trek stars Grace Lee Whitney (reprising her role as Rand) and Mark Lenard (playing the Klingon captain). Of note: Marcy Lafferty, William Shatner's wife, also appears. Gene Roddenberry returns as producer, and science-fiction author Alan Dean Foster created the story, which was in turn scripted by Harold Livingston. The special effects team of Douglas Trumbull and John Dykstra, along with the musical score by Jerry Goldsmith, made the movie a landmark epic in the industry. The movie broke both production cost records (with a budget of over $40 million spent) and box office totals. Though described as the "motionless picture" by many fans this film has a classic, with a fascinating storyline. You have to visualise being there on the USS Enterprise NCC 1701 for your thoughts to run wild with excitement.